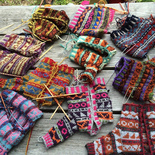 Making this sock teaches a knitter the Swedish technique of tvåänstickning, or twined knitting. Twined knitting is worked with two yarns of the same color, twined around each other, and creates a warmer, denser fabric than conventional stranded knitting. 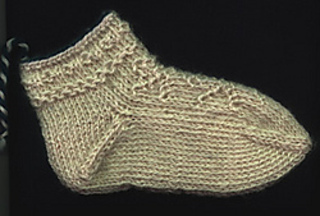 The sock is worked circularly on double pointed needles and includes many techniques: three twined knitting cast-ons, reading and working from a chart, the “O” stitch, Chain Path, a traditional motif for the leg, shaping the toe, and working an unusual method for an afterthought heel.